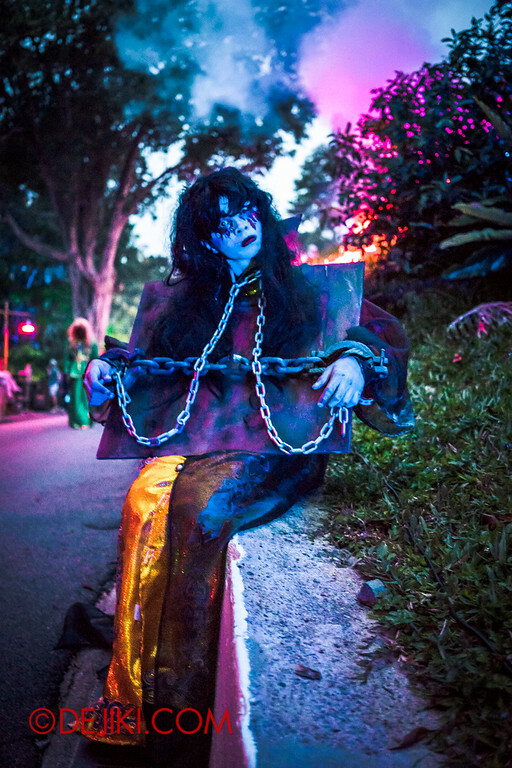 Sentosa Spooktacular 2014 is set to overwhelm thrill-seekers with its new LADDALAND outdoor scare experience and three terrifying haunted trails based on Thai horror films Countdown, Alone and Swimmers. 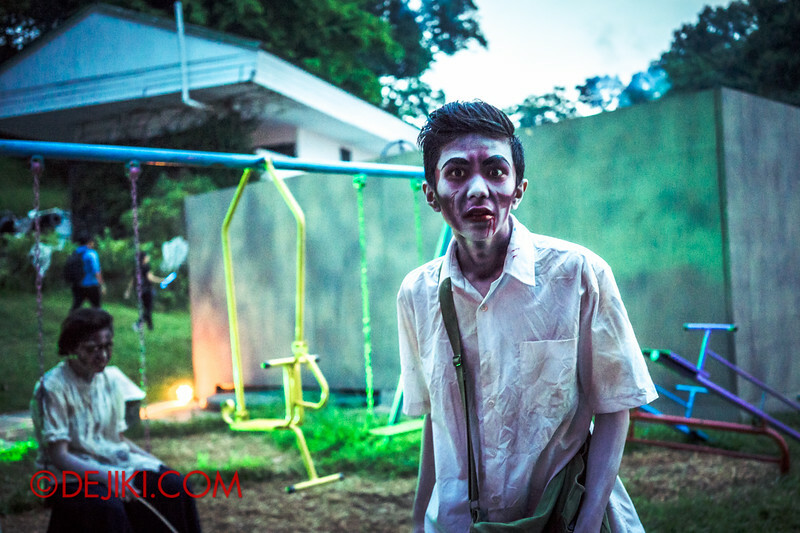 Discover the new terror at Fort Siloso in this review and extensive photo report. 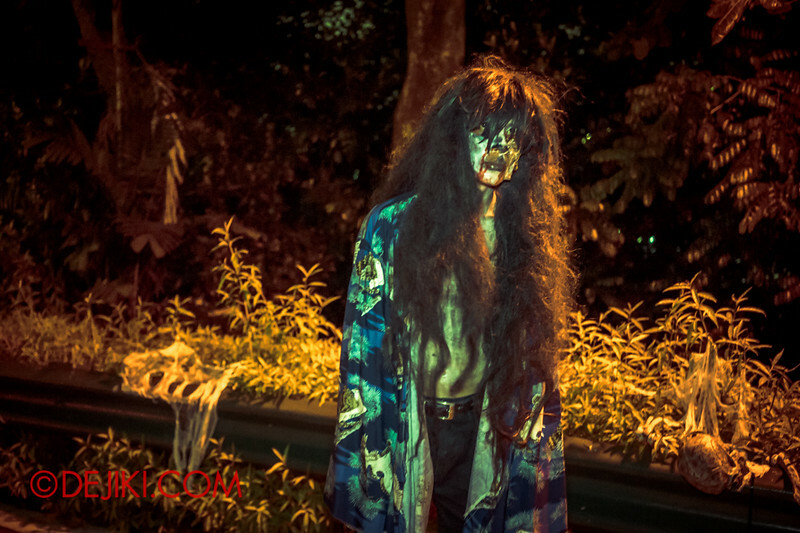 For the past few years, Sentosa Spooktacular has always billed itself as “Asia’s Scariest Fun”. This year, it’s definitely something else. 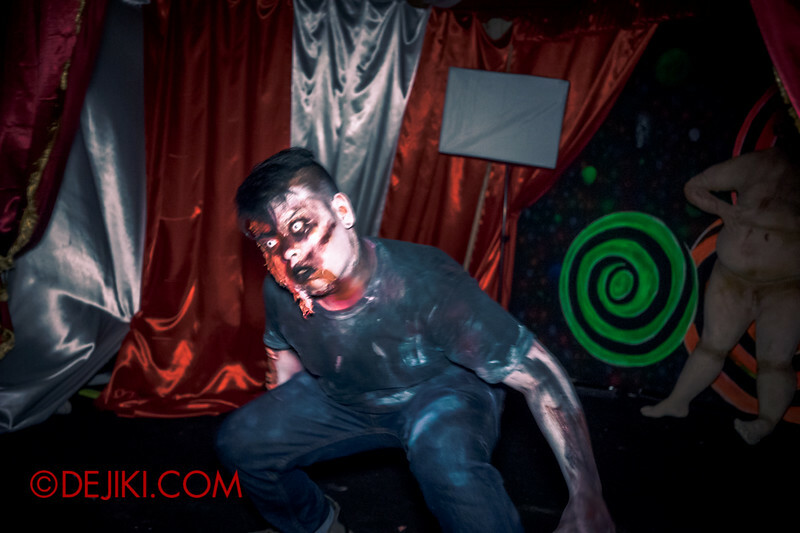 Going through the three haunted trails (haunted houses) will test your mettle and leave a burning question: What is your breaking point? 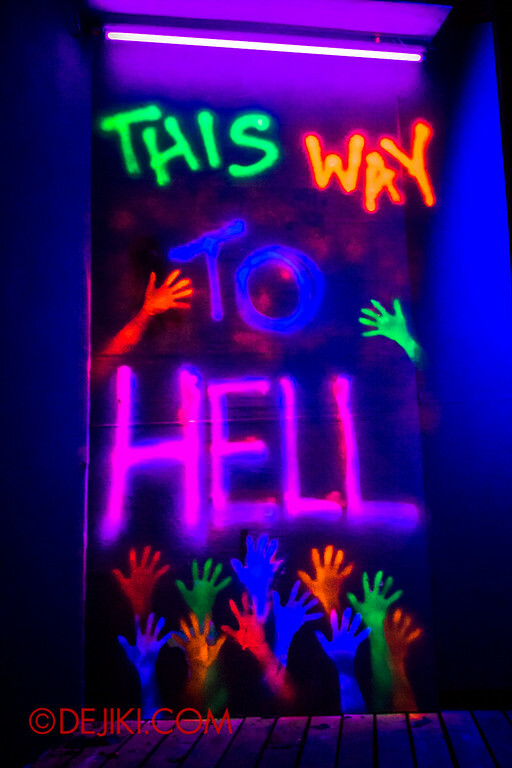 Last year’s haunted trails already made use of innovative and surprising scare tactics. 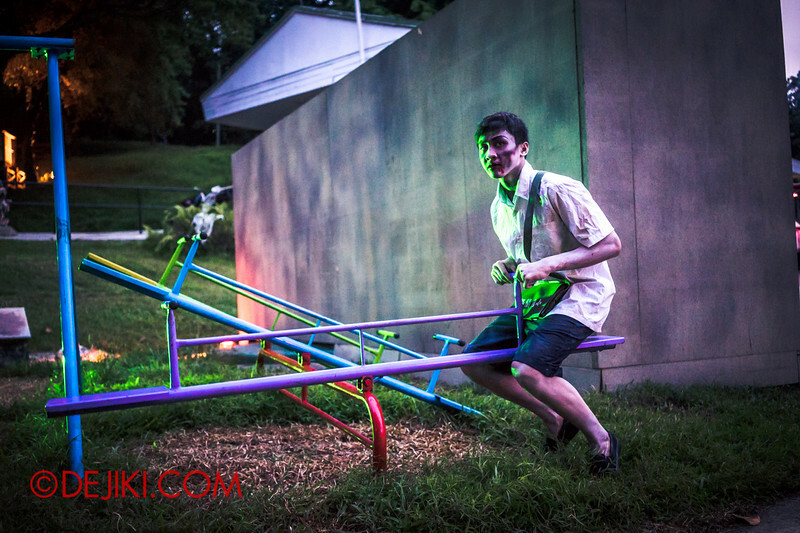 At this year’s trails, no mercy will be spared. 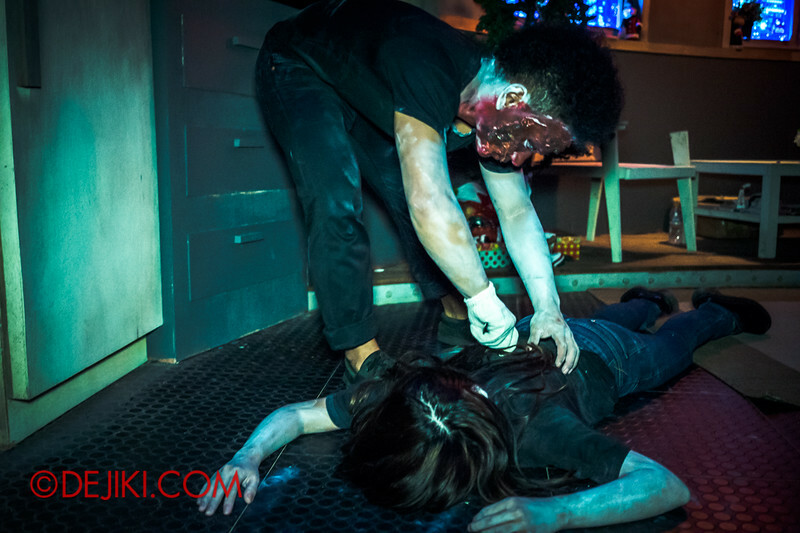 There are more unexpected elements for a truly tormenting experience. 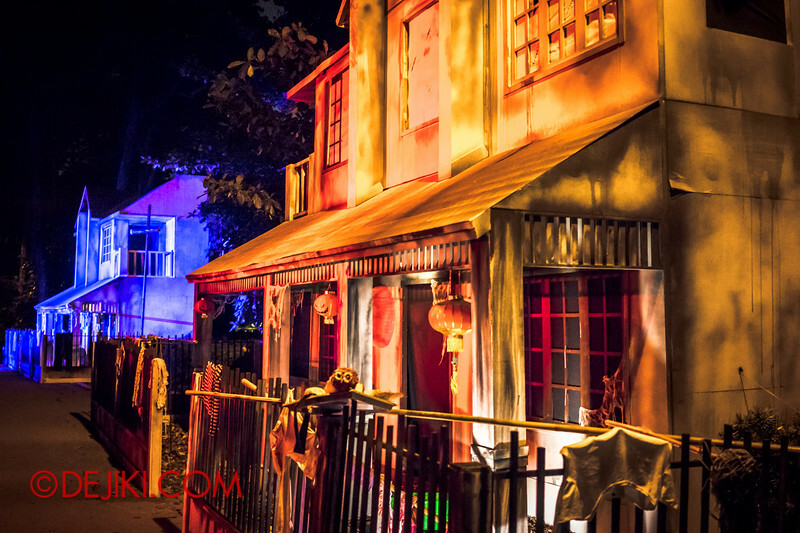 Although it seems as if the event is smaller as there are three haunted trails (in 2013 there were five), two of this year’s trails are much longer, almost like two houses. And there are no joke houses unlike last year. No nonsense, and just serious scare business this time. 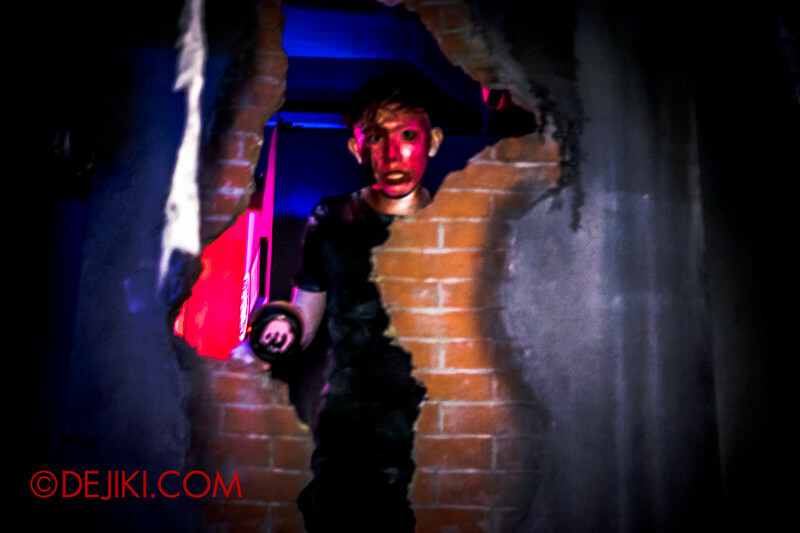 While the quality of the production (props, sets, costumes and make-up) have improved slightly, the creative team has certainly spent more effort at devising scares. 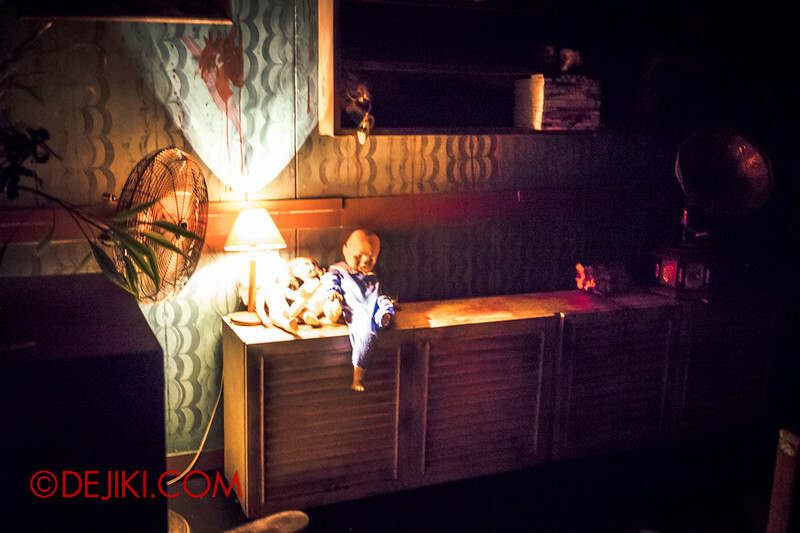 Spooktacular won’t be able to match Universal’s HHN4 in most ways, and they certainly should not start to try. 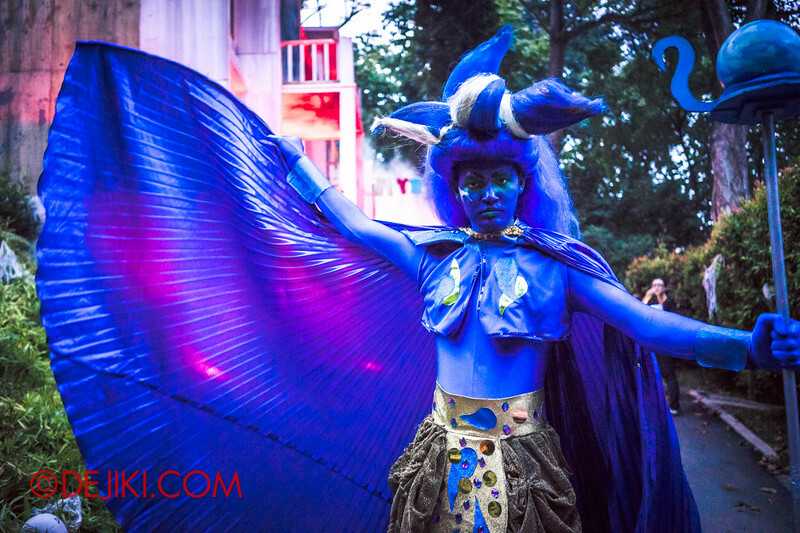 There aren’t stunning details or beautifully produced theatrics to admire here. 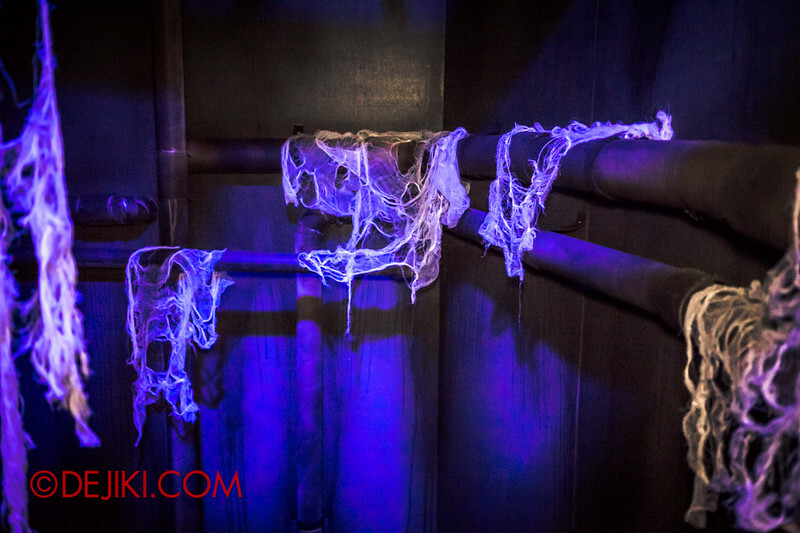 (In fact, the paint is still rough along the edges at many places…) On the contrary, Spooktacular has a clear focus on horror, and they did exceptionally well in making its haunted trails immensely terrifying, again. 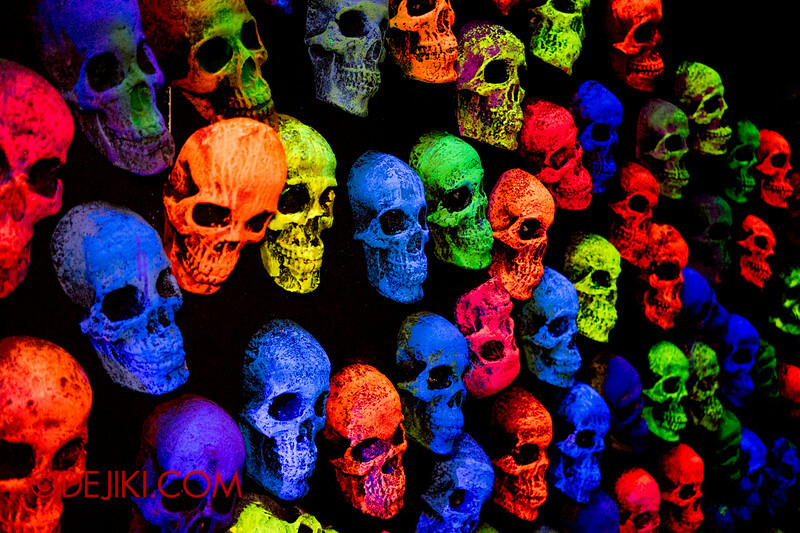 Some of the most disquieting experiences involve looking at things that can’t be really seen. The same goes for the sense of hearing… You know those scenes in horror films where the sound just drops dead? 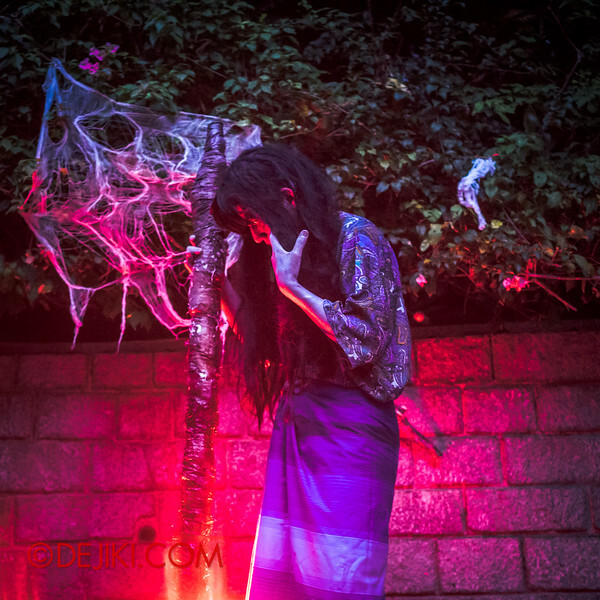 There are so many of such moments in this year’s haunted trails, I lost count. There will be moments where you feel like you are running in fear of your life. 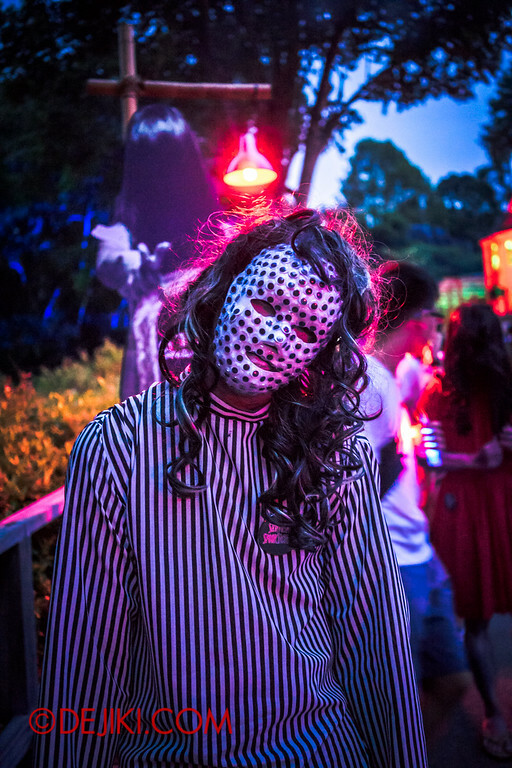 Sentosa Spooktacular 2014 is definitely the event for people who still think they could stroll through haunted houses unscathed and put up a poker face. Who dares, wins? Not anymore. 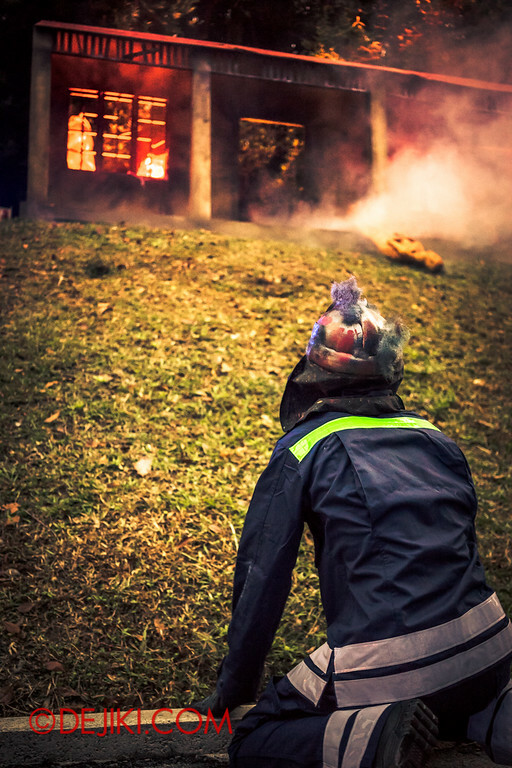 Your courage and endurance will be thoroughly tested at Fort Siloso. 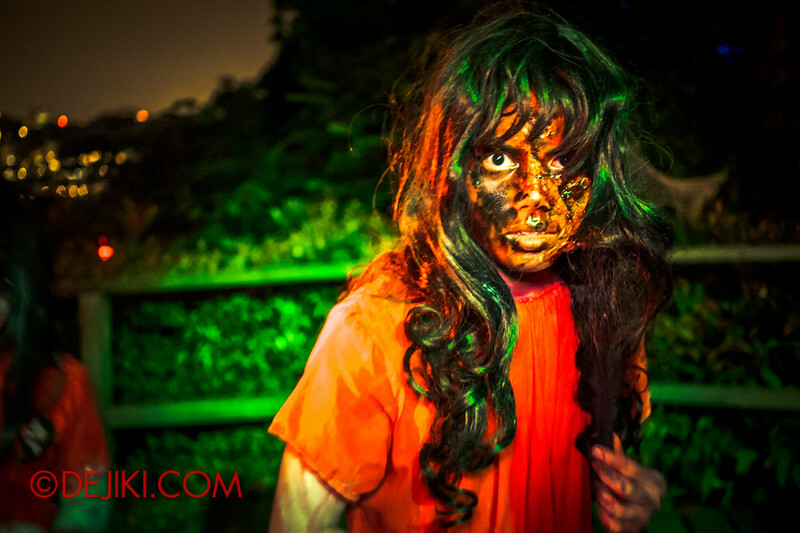 Special Thanks to Sentosa Spooktacular for inviting Dejiki.com to the Media Preview night. 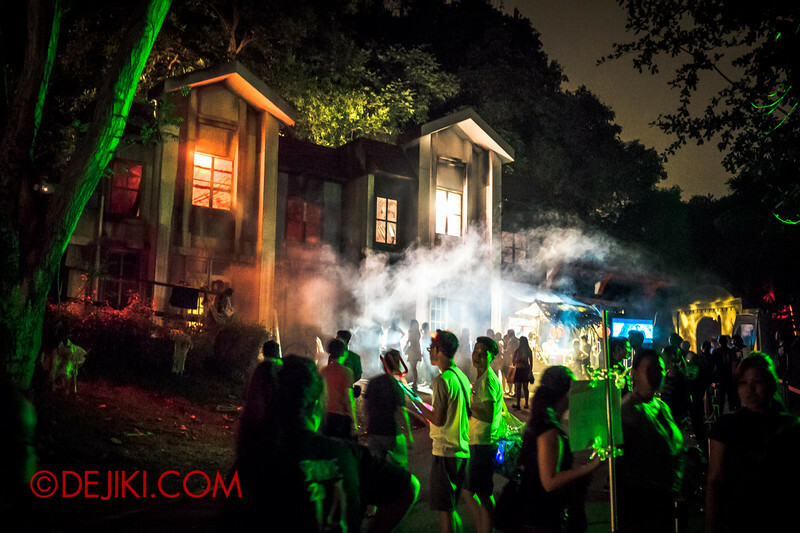 Based on horror film Laddaland, the outdoor areas of Sentosa Spooktacular 2014 have been redecorated as some residential district where things go terribly wrong. 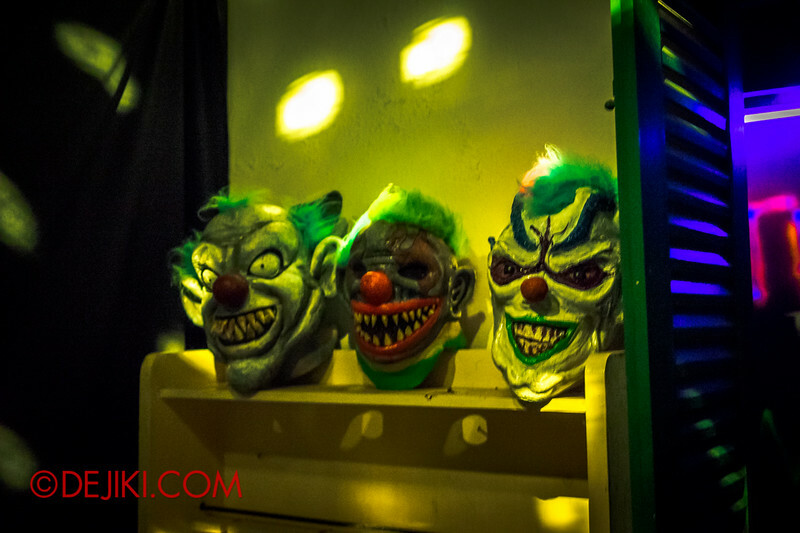 Haunted Trails take place in separate buildings in Laddaland. 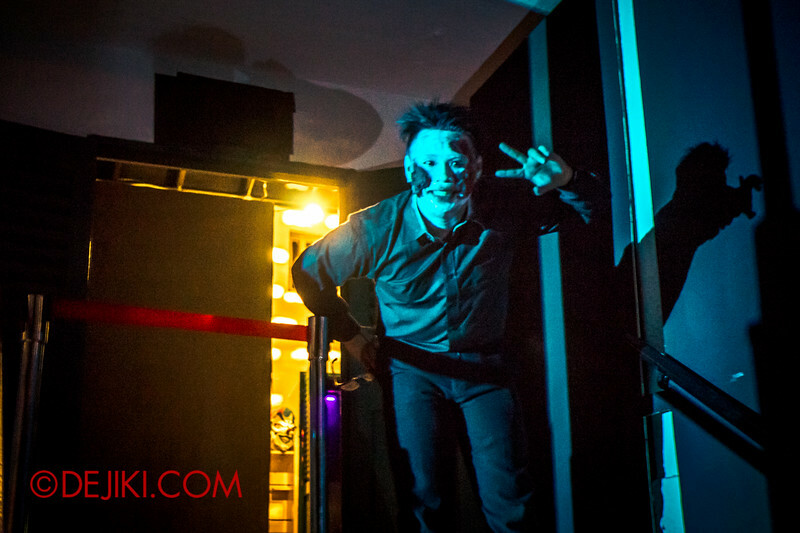 This particular scare actor followed us all over the place for half an hour. 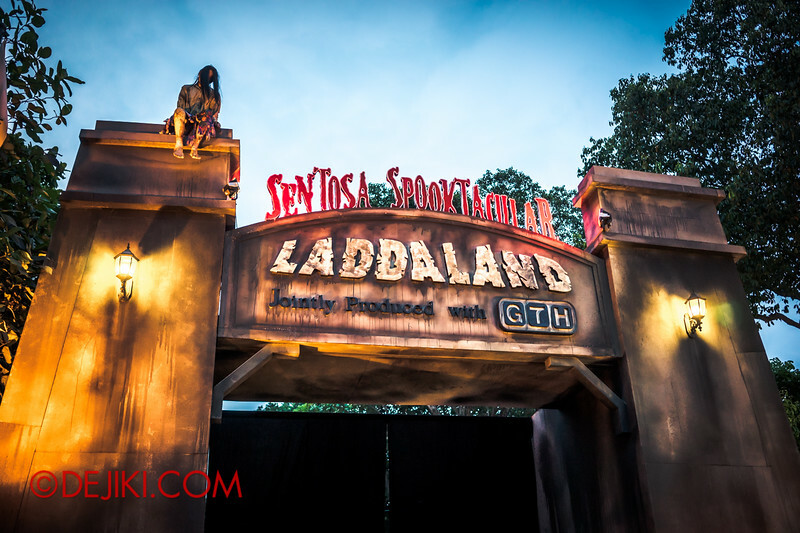 After a short walk up a slope, the entrance to the Countdown haunted trail greets guests in first section of Laddaland. 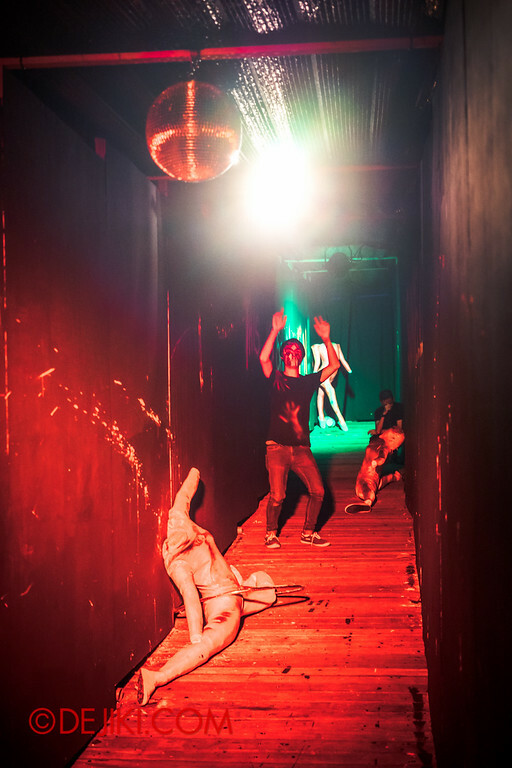 A bouncer welcomes us into some sort of deranged club, where party-goers dance around in dark corridors. They are actually having fun. But the loud music diminishes after a while, and the real haunt begins. 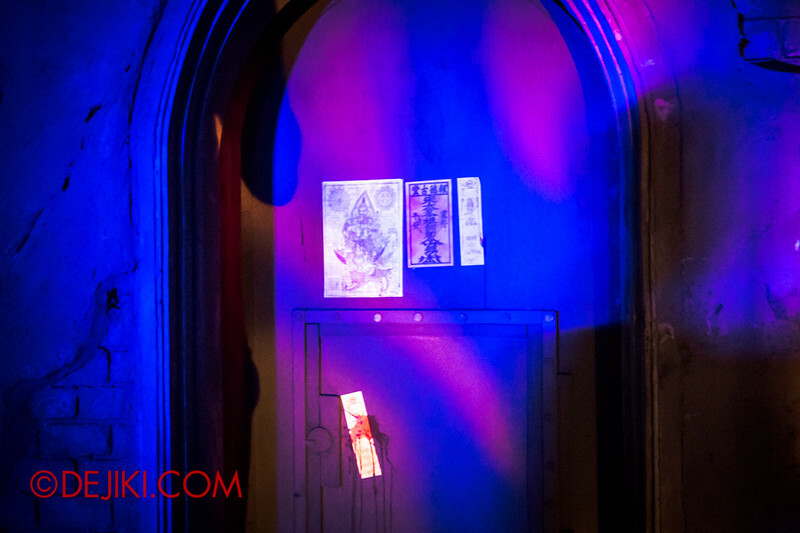 Climbing through parts of the building, we get glimpses of the story of Countdown. 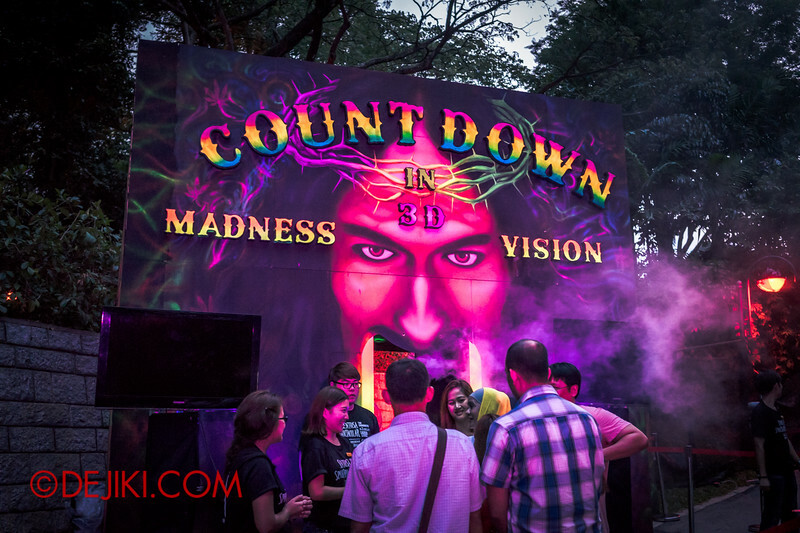 Remember seeing “Countdown in 3D” a few photos up? 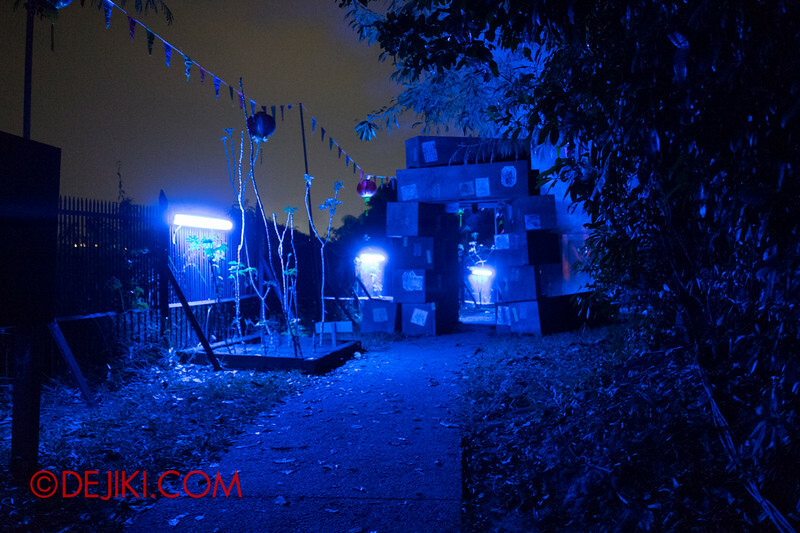 This haunted trail has a 3D section. The extended 3D experience in Countdown is a surprise, really. It’s very long, and even went outdoors. While is novel and would be appreciated by all guests, it could raise quite a far bit of questions. 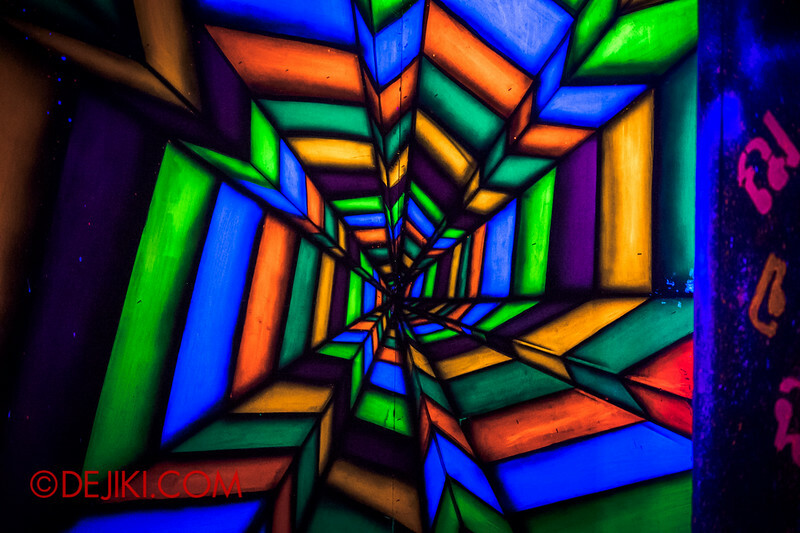 There are gaps in the experience (how did we end up in this psychedelic world? Have we died in the apartment?) and things that don’t fit in at all. 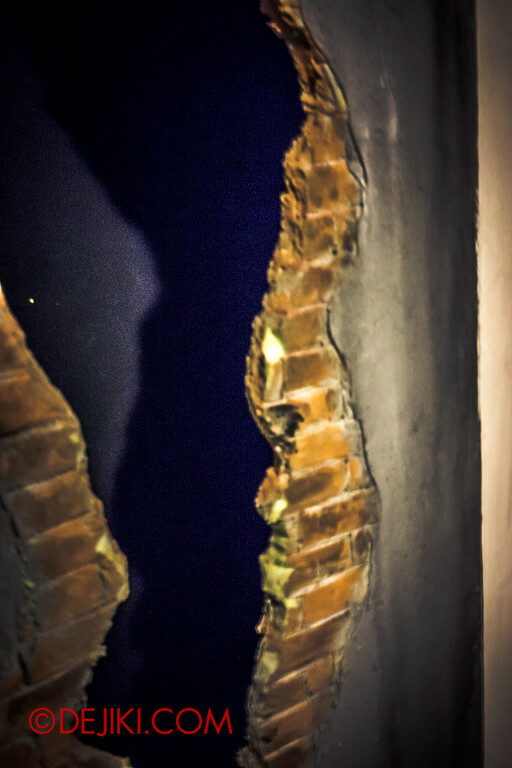 But if you don’t ponder over such details and the completeness of the concept, it is still a fine haunted trail. 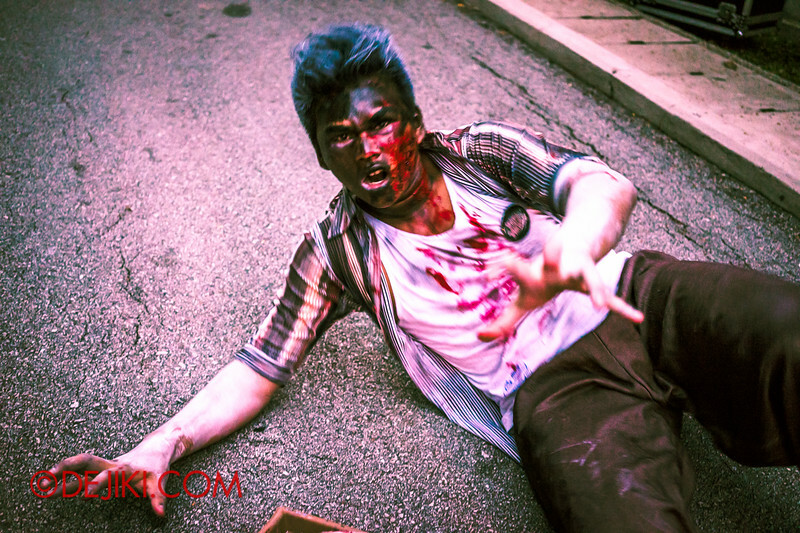 Scare actors dance to set a deceptively cheerful mood. At the other side: A creepy alley between apartments. After which they will end up in the utility section of a building. Crawling out: To another apartment. 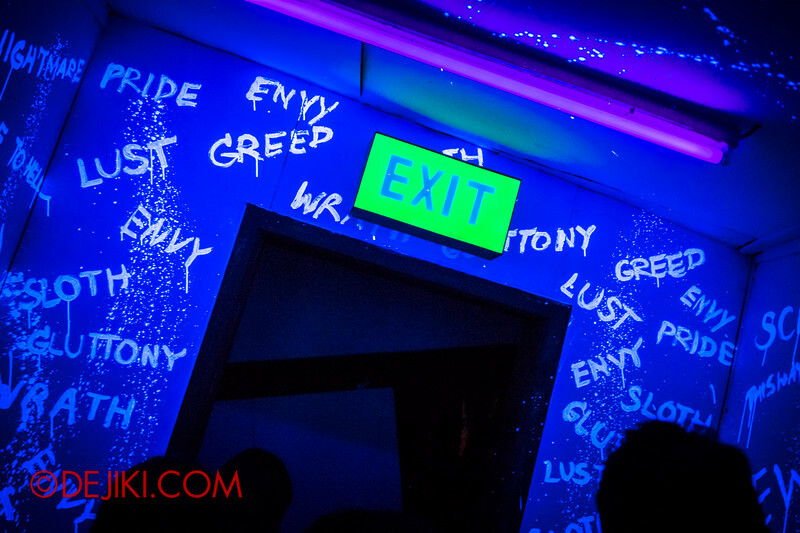 A place where grisly things happen. Thereafter, the 3D maze section begins. Which is a long and confusing experience, really. The 3D segment is so long, it actually went outdoors. After leaving Countdown, the path leads to the Fort Siloso Square area, which happens to be near the start of the queue for Alone. 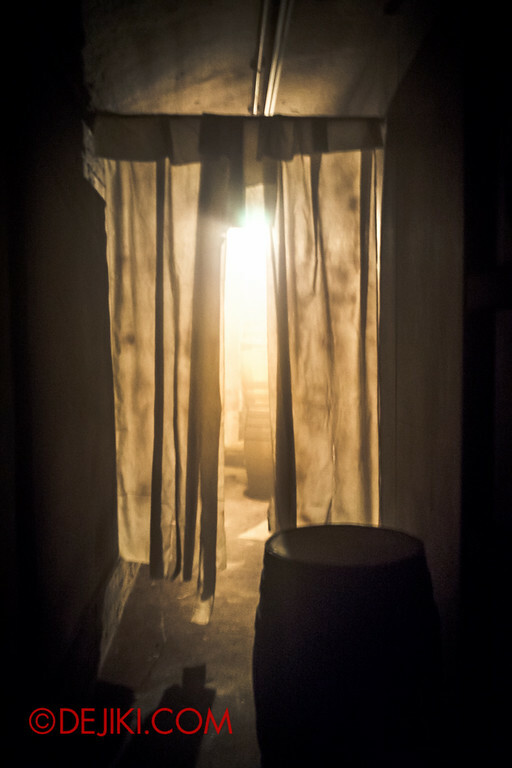 Guests are usually let into the Alone haunted trail in pairs. It’s a story about twin sisters, Pim and Ploy, anyway. 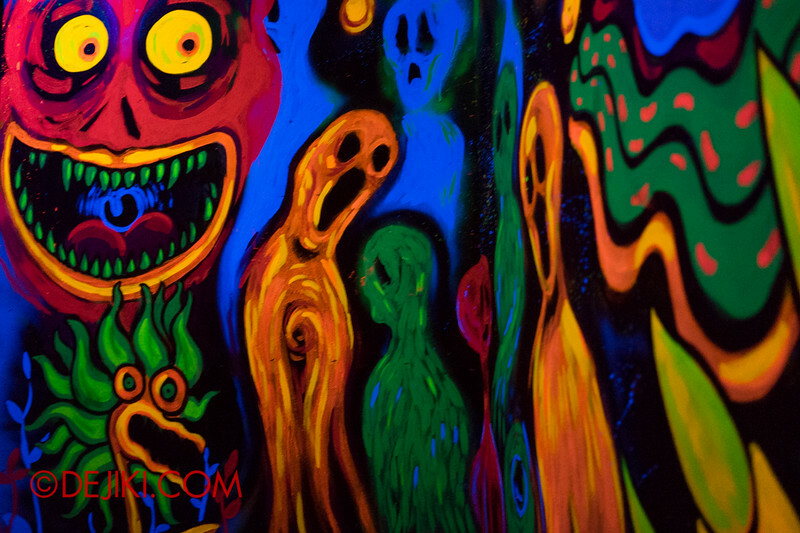 If you are going to Spooktacular in a big group, I highly recommend splitting up. The tunnels are dark and filled with pipes that you have to duck under and walk over. 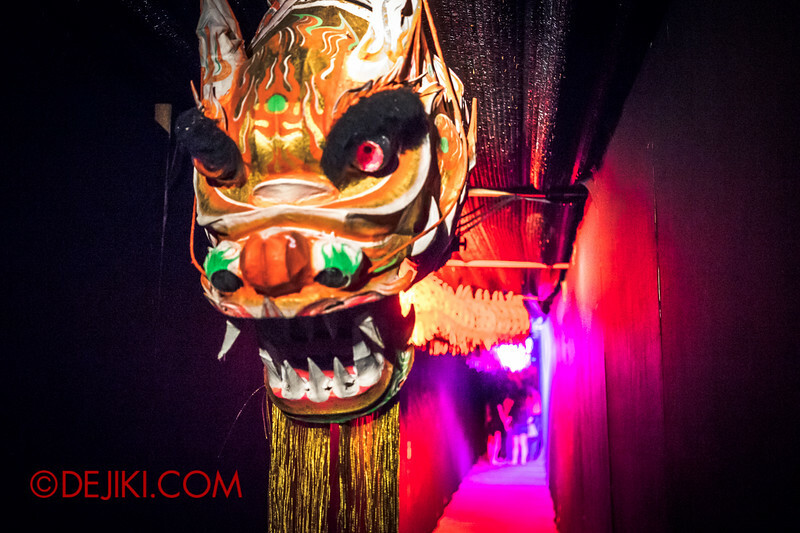 There are cramped, dingy corridors with scares at every corner. 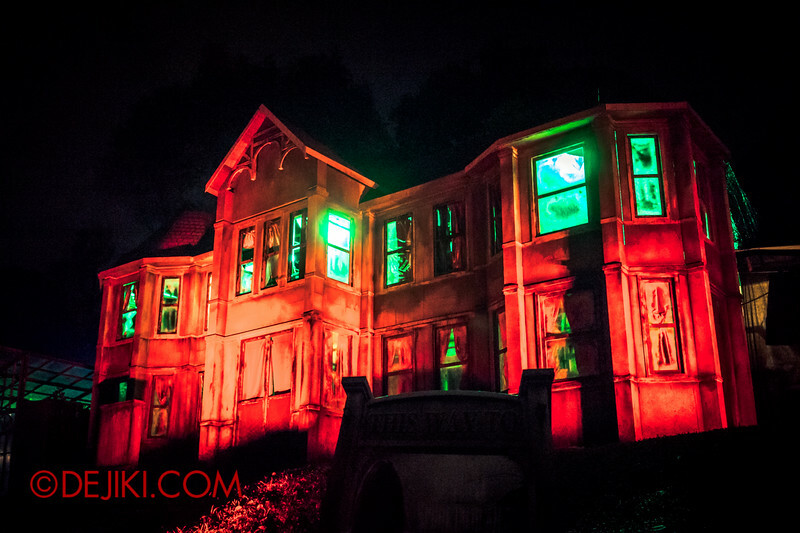 After surviving the tunnels of torment, go up the steps for part two: The house on the hill. 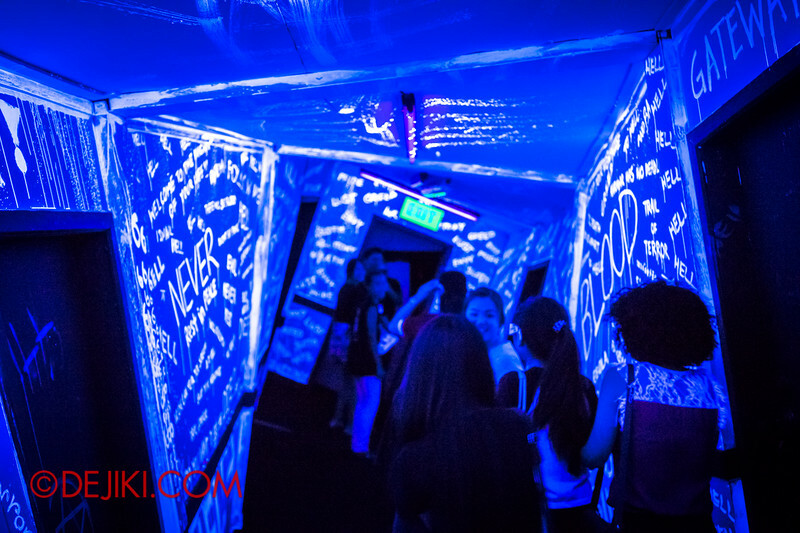 A staff member spurred us into continue into a hallway that was pitch black. 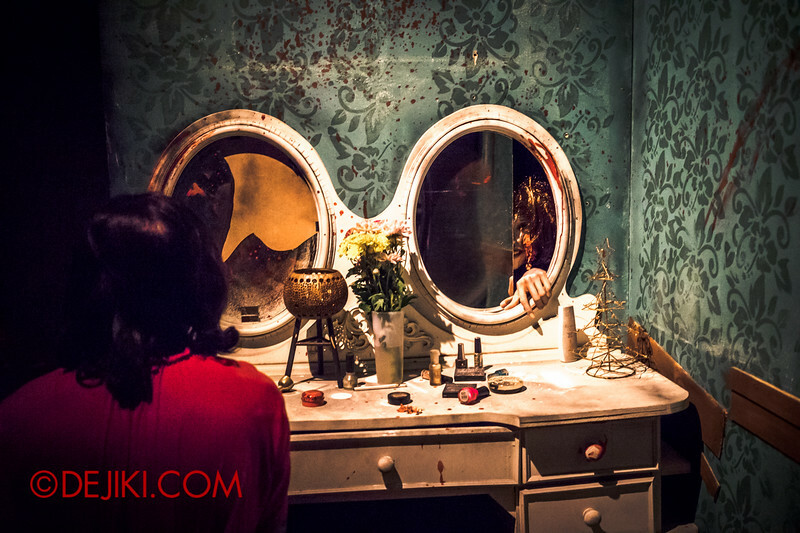 Moving on, we were nothing but disturbed in this haunted house. 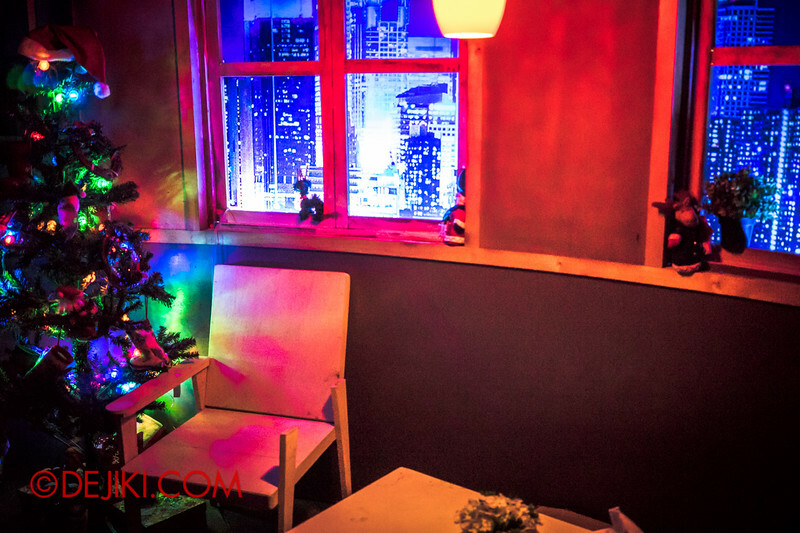 This is where you can find many of the more elaborate sets created this year (along with heightened scares, of course). The trail led us into a greenhouse, which we believed was the final section of this haunted trail. Nope, there is more to go! 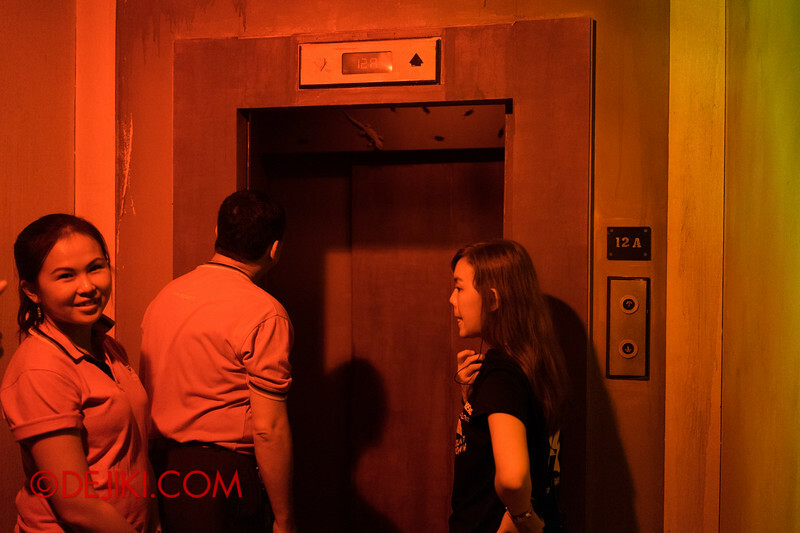 The final segment, which takes place in an air-conditioned building, is where the most effective scares happen. 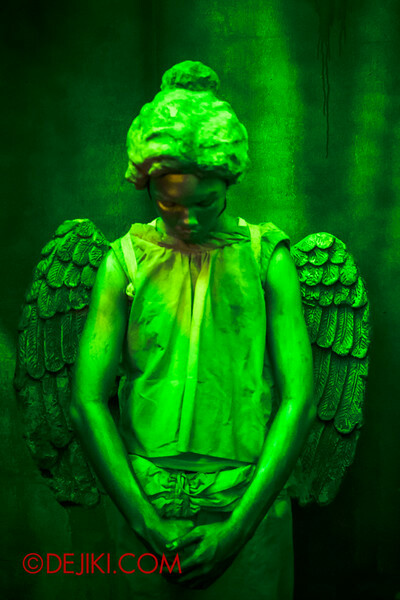 It gets deadly silent in many rooms, and your mind races with thoughts on what could go wrong. I shouldn’t spoil them here, but wow – I had so many jump scare moments here. More like three haunted houses after another, Alone is definitely the scariest experience I had this year. It tests not just your guts, but your endurance. You will be able to hear your heart beating faster, and your breathes going deeper. 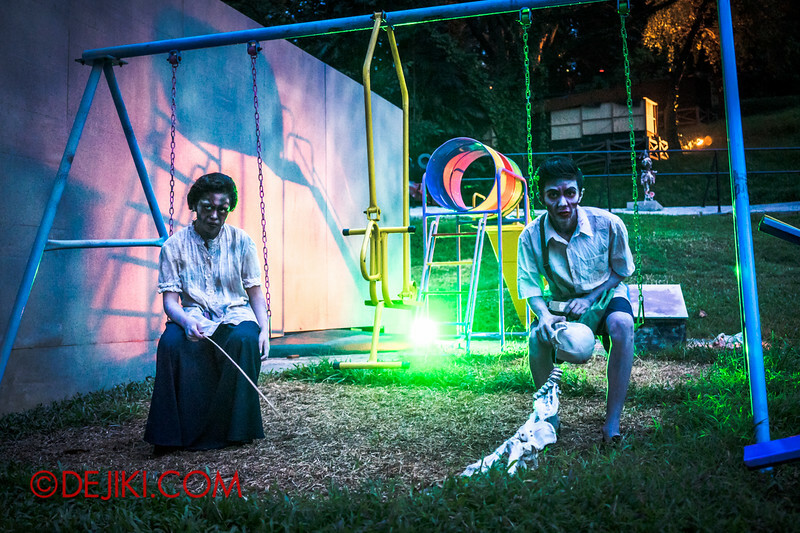 This is a story about Siamese twins, and you will be glued to your partner just like that in this haunted trail, asking yourselves: Is it EVER going to be over? 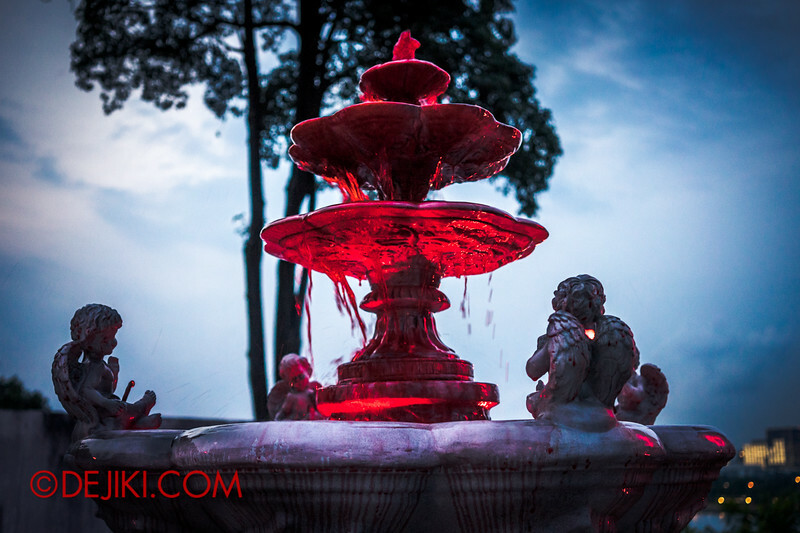 Haunted swimming pools and a curse of drowned swimmers surround this haunted trail. 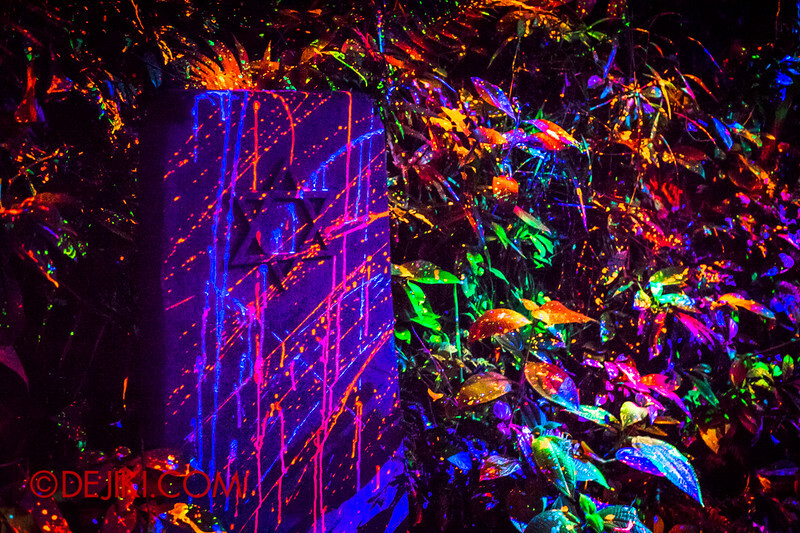 Recreated in the same space as that terrifying Body trail last year, there are much more “obstacles” this time. 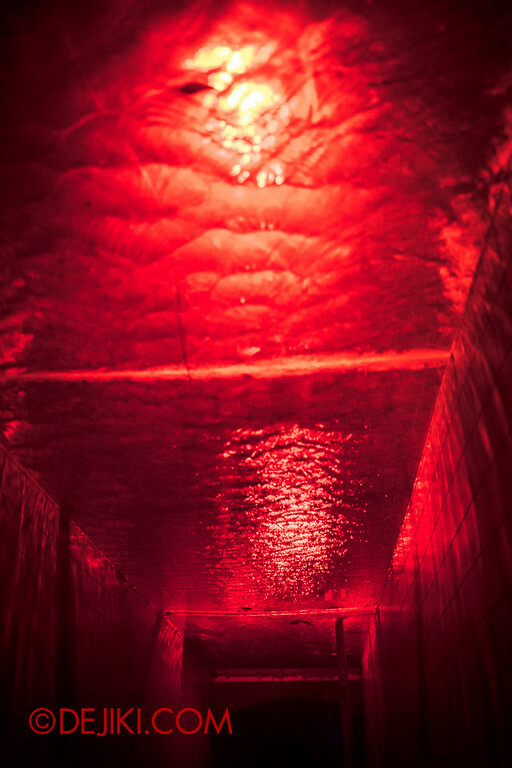 The Swimmers trail definitely has many interesting scenes, such as this one, which simulates being underwater. 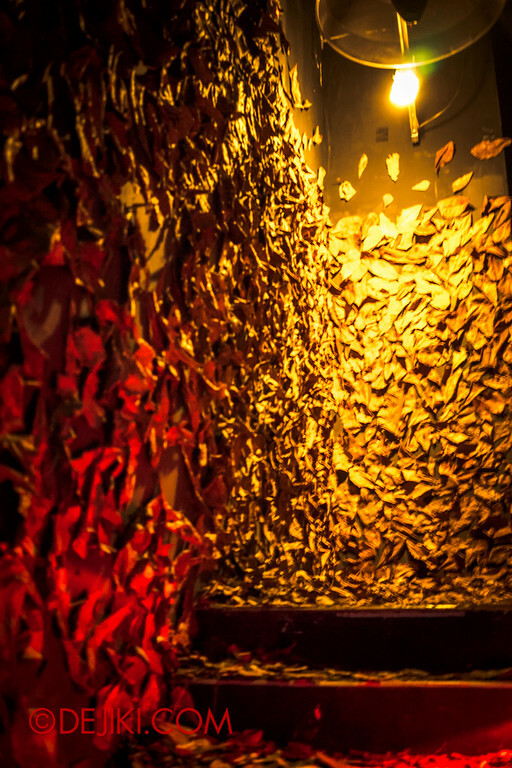 But the key highlights will be the cramped and tight spaces that you’ll be forced to wade through. You can’t even walk straight. 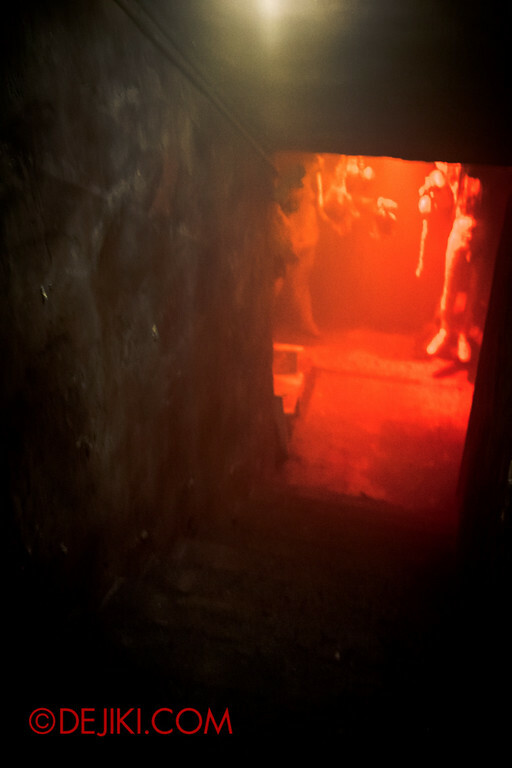 After several “pool” scenes, the trail led us outside, where things get more grotesque and disturbing. 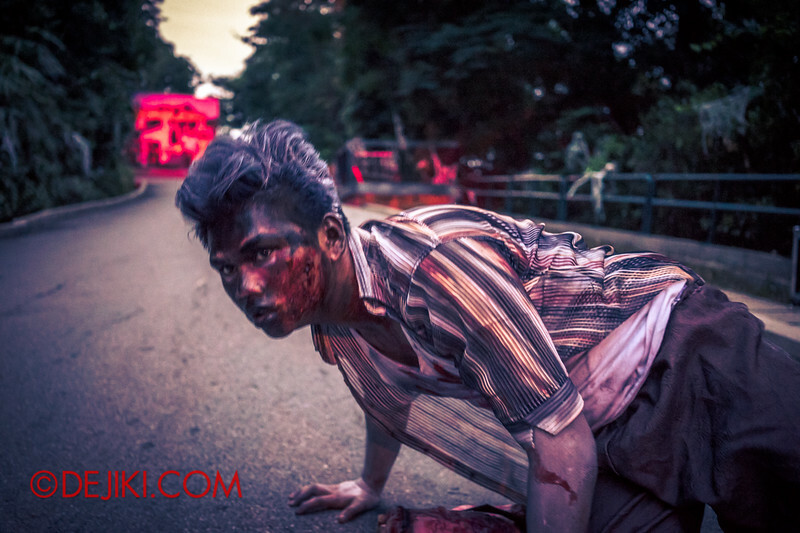 The story is presented quite non-literally, but you won’t have time to ponder what each scene, or what the props mean – especially when you are running away in fear. 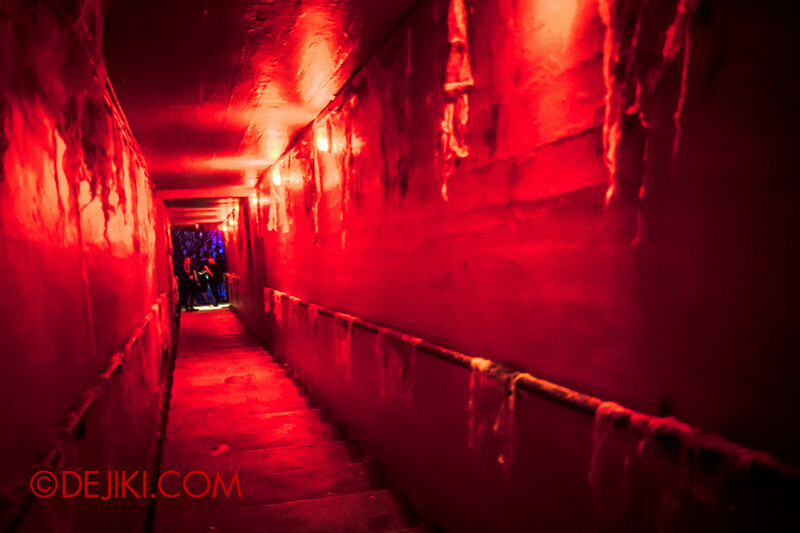 The experience follows on with very, very long corridors through what appears to be a crypt or netherworld of sorts. 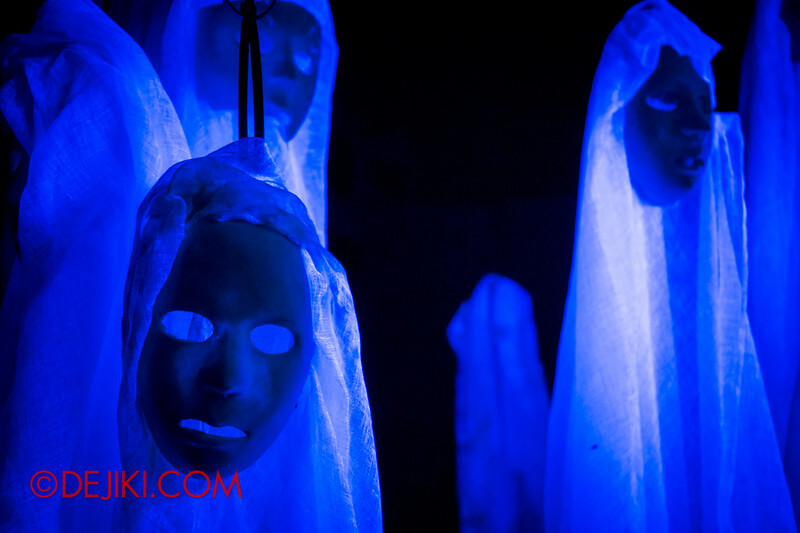 Among all three haunted trails, Swimmers is the shortest trail. 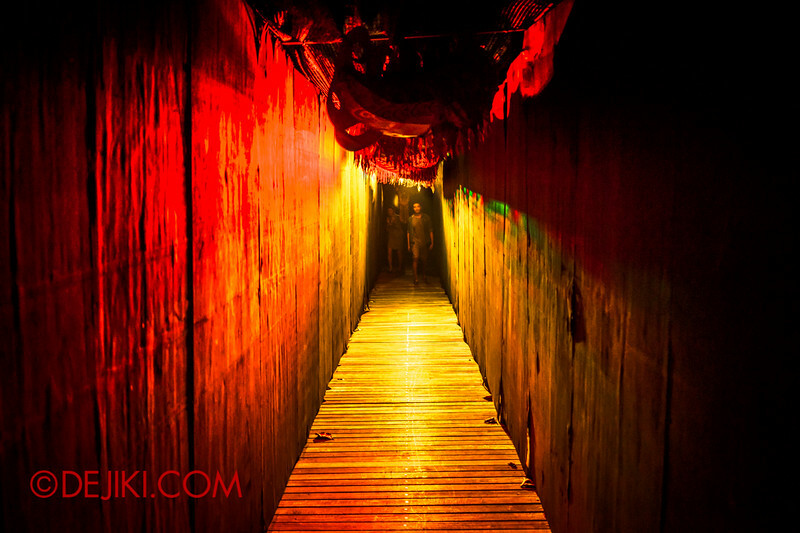 Depending on what makes you terrified, it won’t be a simple walkthrough, though. Comfort zones will be stretched and there are things just waiting for you. 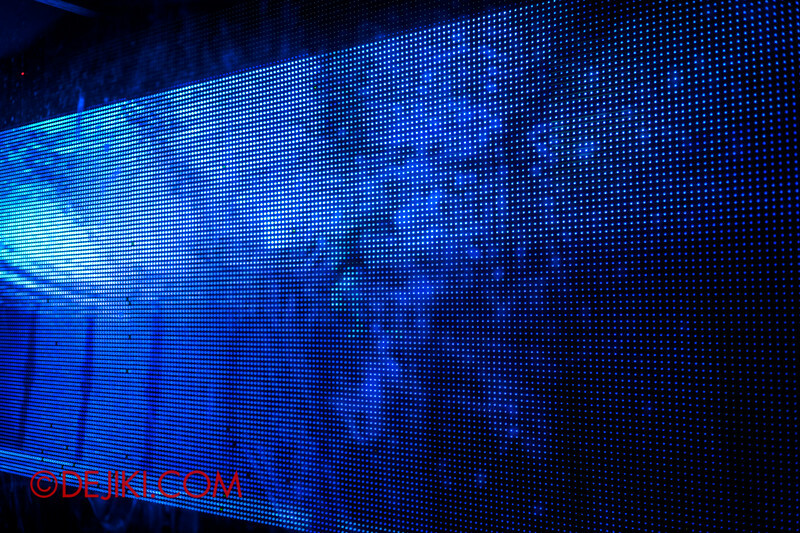 So do pay attention… at every corner – dark or not. 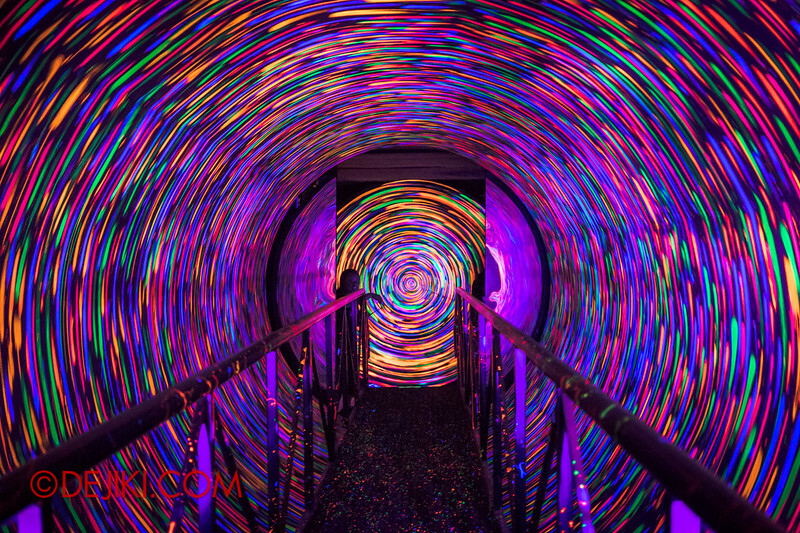 The “womb obstacle course” that guests will have to wade through. Friendly staff can be met all over the event area. 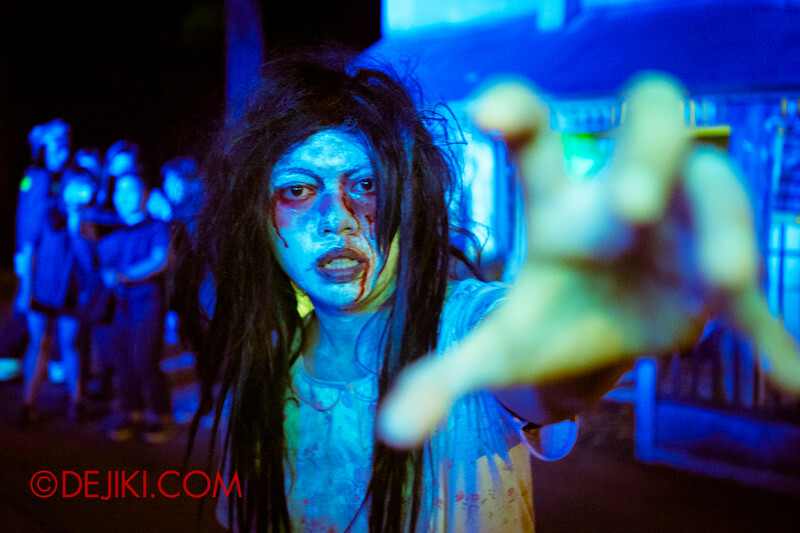 They will be the only cheerful faces you see at Sentosa Spooktacular. Once again, I applaud the staff their candid antics, jokes and attention to safety guidelines. 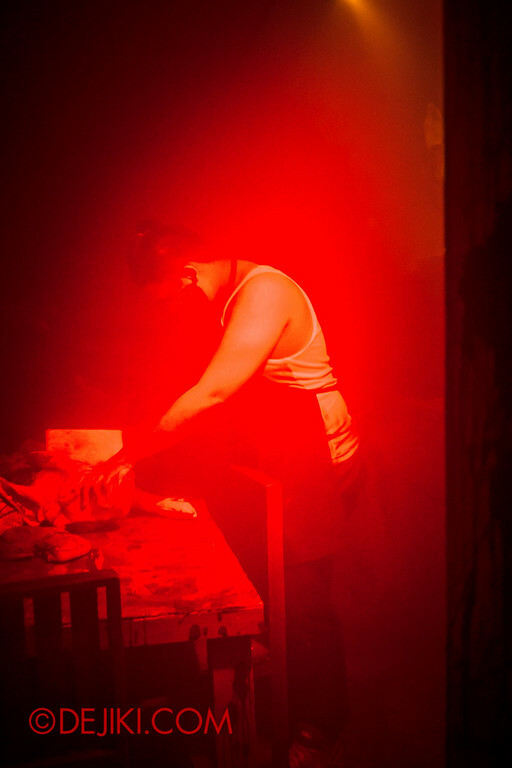 You can’t enter a haunted trail without hearing the safety brief from the staff. 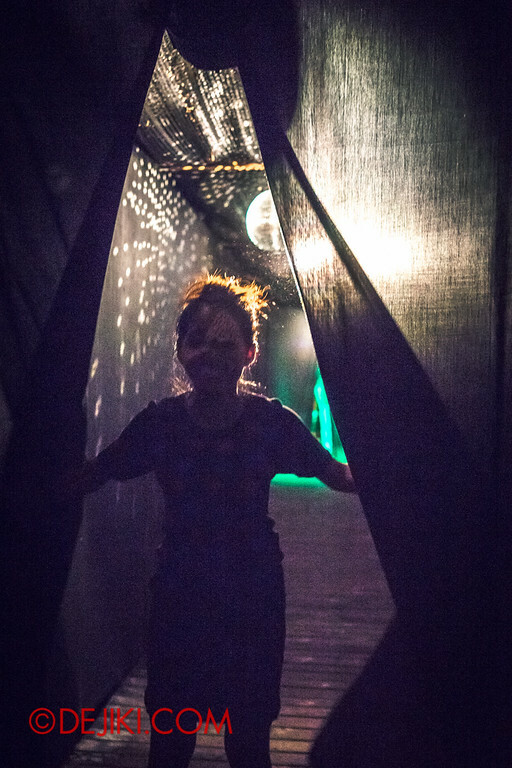 You might feel great after walking out from the Swimmers haunted trail. It’s done! Oh don’t think you’ll be let off that easily. The rest of Laddaland and its residents await your return. 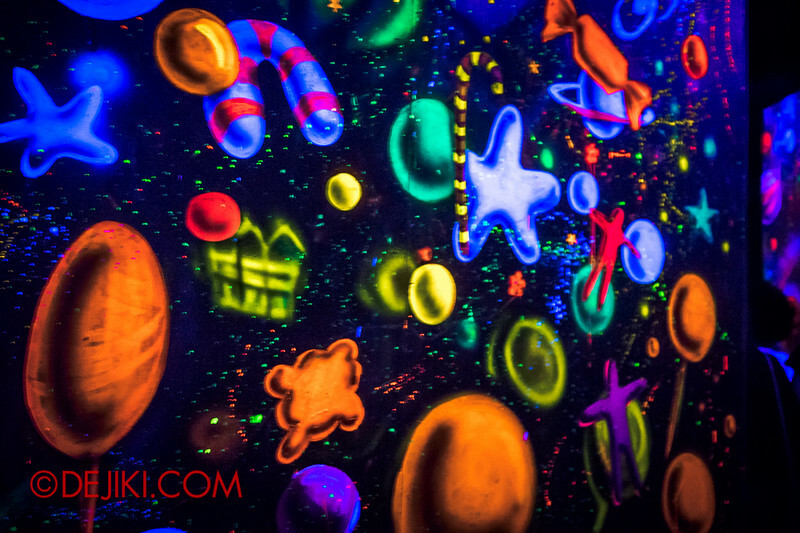 Feel free to take pictures with them, but don’t linger too long… or you’ll never get to leave. 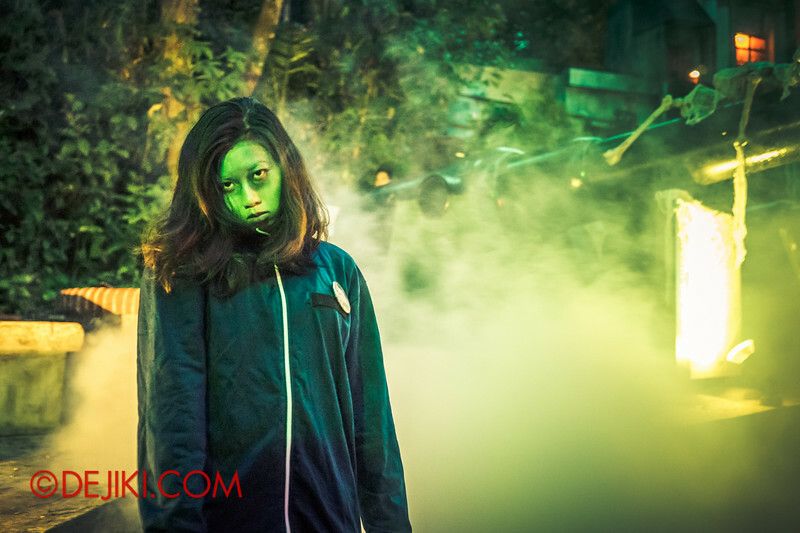 Due to the strict control of guests in each haunted trail for the best haunt experience, the guest capacity per hour for each trail is very low. 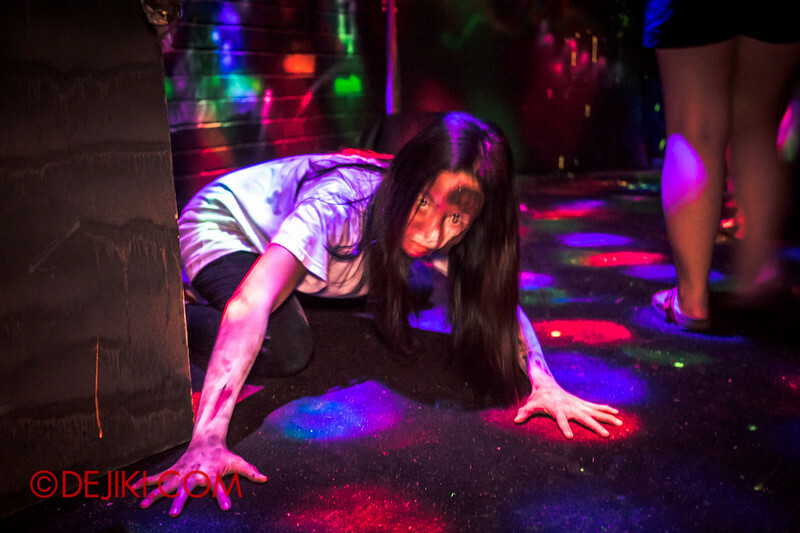 While there will be roaming scare actors entertaining guests in queues, please be ready to stand and queue for a while. For ALONE, it is possible to enter alone, or in pairs. Hence, long wait times are to be expected especially if you arrive late. The event starts at 7pm, but I would suggest being at the entrance way before (6:30PM at least) to queue and wait for the event to start. 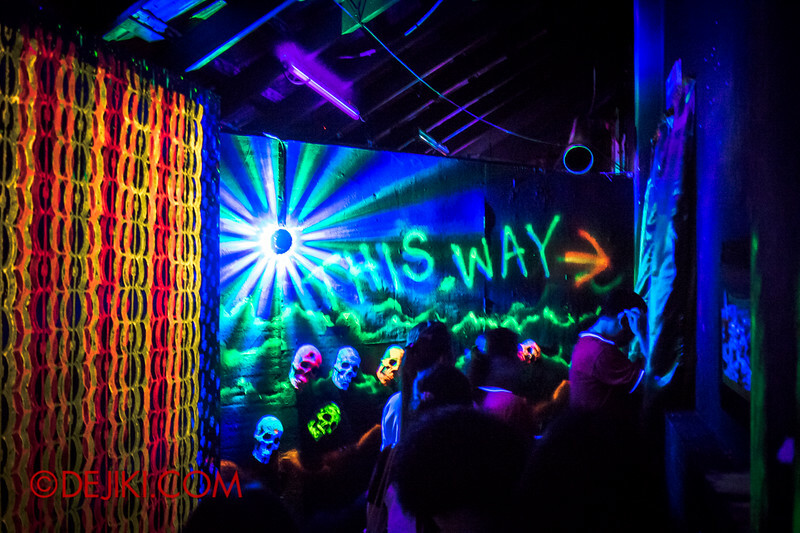 This way, you can get to Countdown early and get the nightmares rolling. 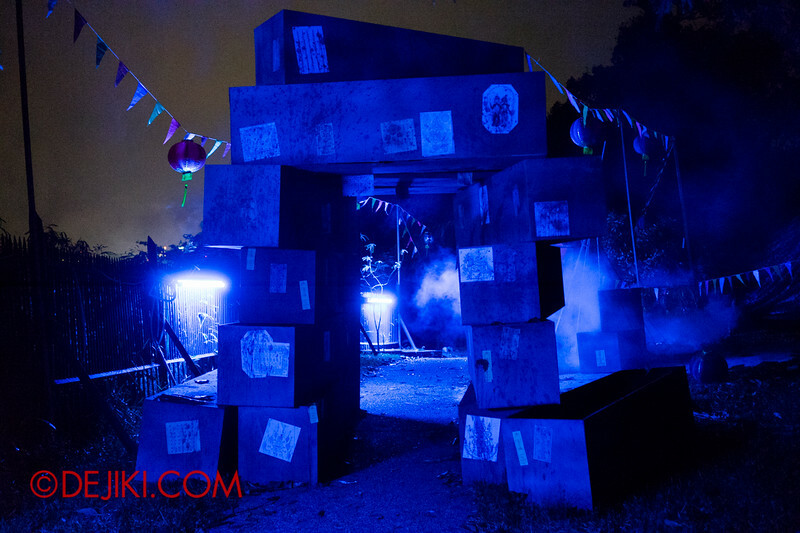 Do note that while the event ends at 1:00AM, entry to Fort Siloso ends at 9:30PM except on certain nights (25th Oct and 1st Nov) determined by the organiser. 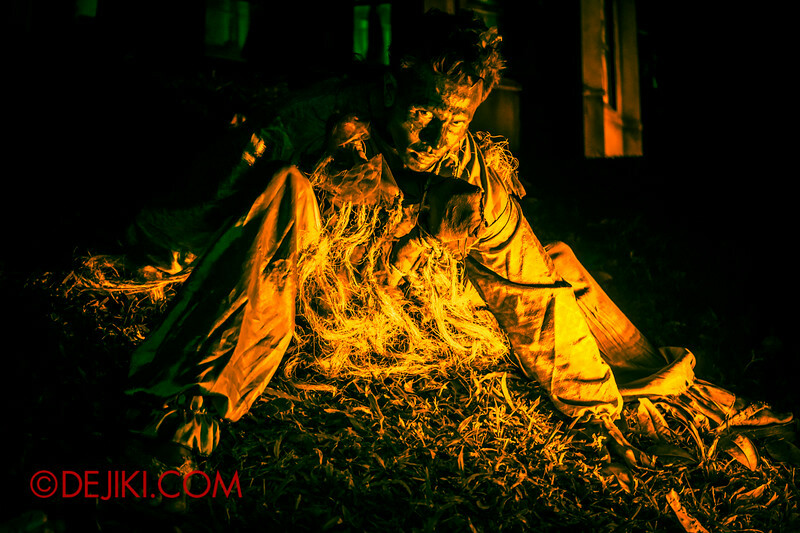 You can’t just stroll in at 11PM with a normal admission ticket and think that you can visit haunted trails without waiting. You can get to Fort Siloso via the Sentosa Buses. Basically you just need to take a service to Siloso Point (where Underwater World and Fort Siloso is) and walk to Fort Siloso. 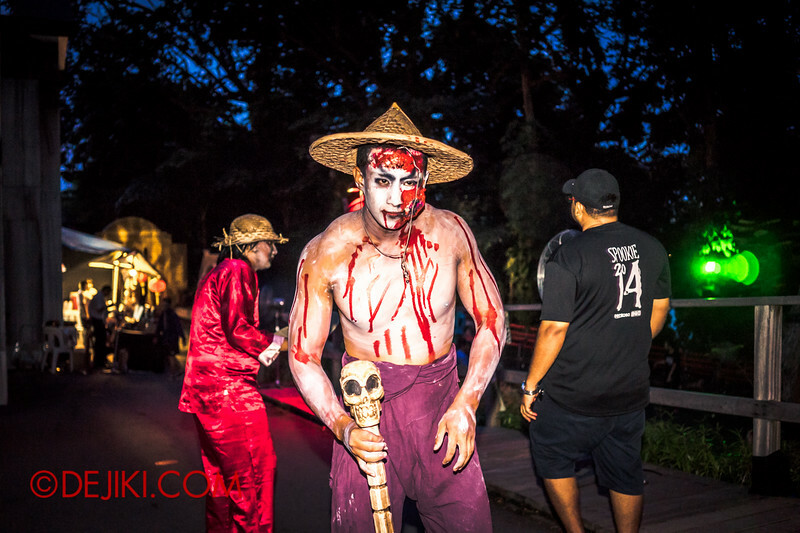 The last bus to Sentosa Spooktacular will depart the Beach Station at 9pm on all dates except 25 Oct and 1 Nov. Only for those two dates, the last bus will depart from Beach Station at 11:45pm. 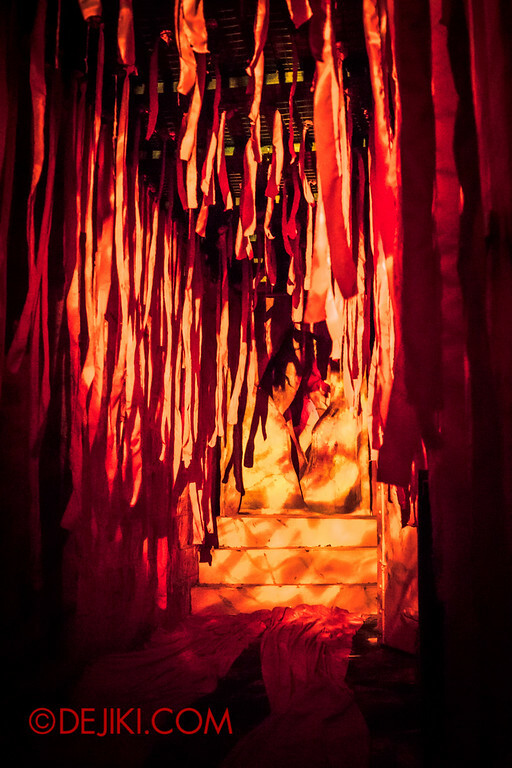 Do you dare to enter LADDALAND? 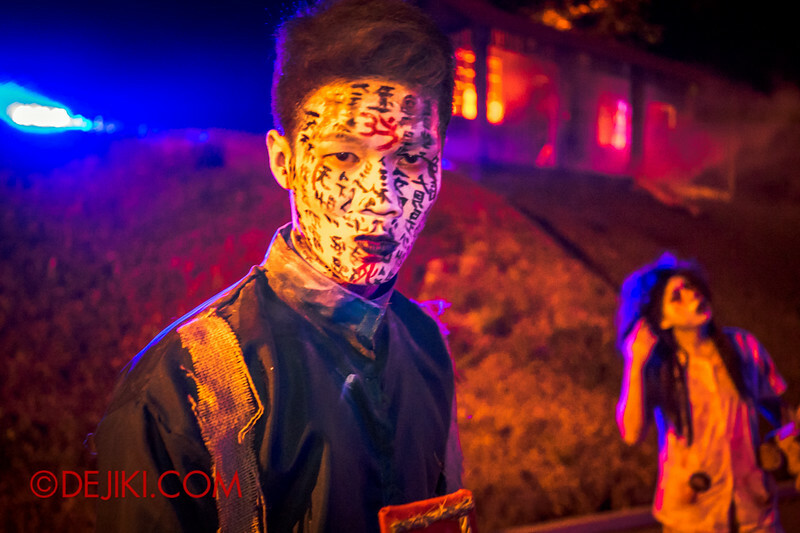 Find out more about Sentosa Spooktacular 2014, including event hours and ticketing here. 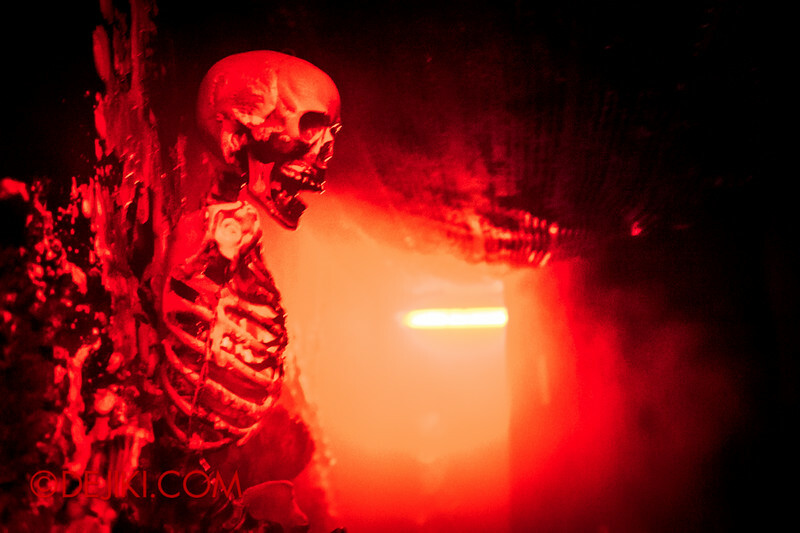 do you have any idea how long is the waiting time for each of the haunted house if we have an express pass? 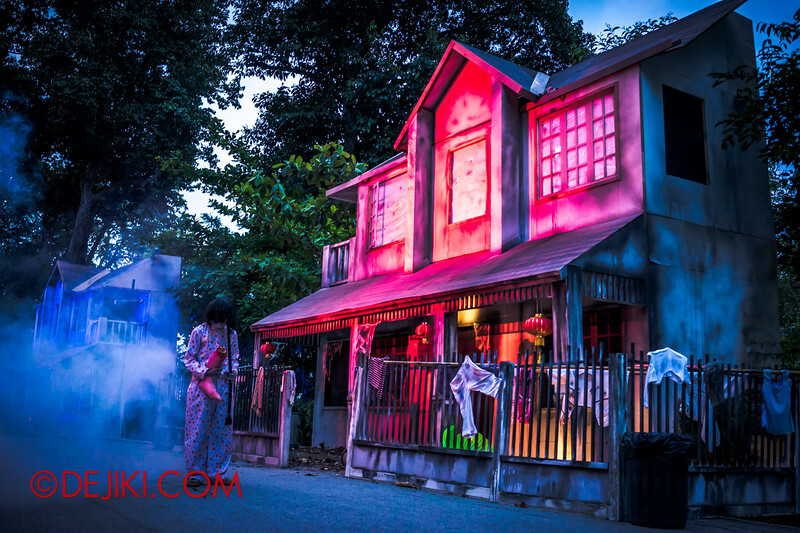 will we be able to complete all 3 haunted houses if we reach there by 830pm with express pass? It’s difficult to predict how long the wait time for Fast Pass Lane would be, as the situation changes every night. The normal queue can hold up to about 2+ hours of wait. Given last year’s experience, it could be a 10-20 minute wait on the Fast Pass queue (when normal queue is about 1.5+ hours). 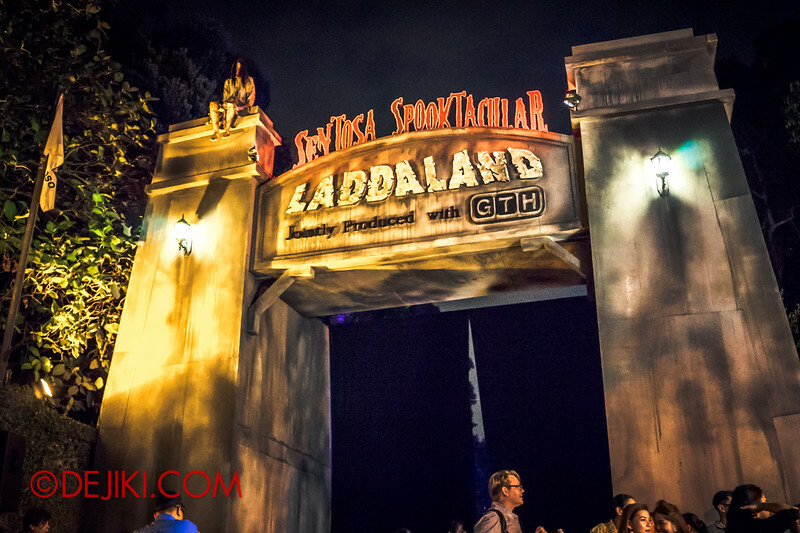 Spooktacular closes its gates at 9:30PM to ensure that all guests can experience most of its attractions and leave by 1:00AM. 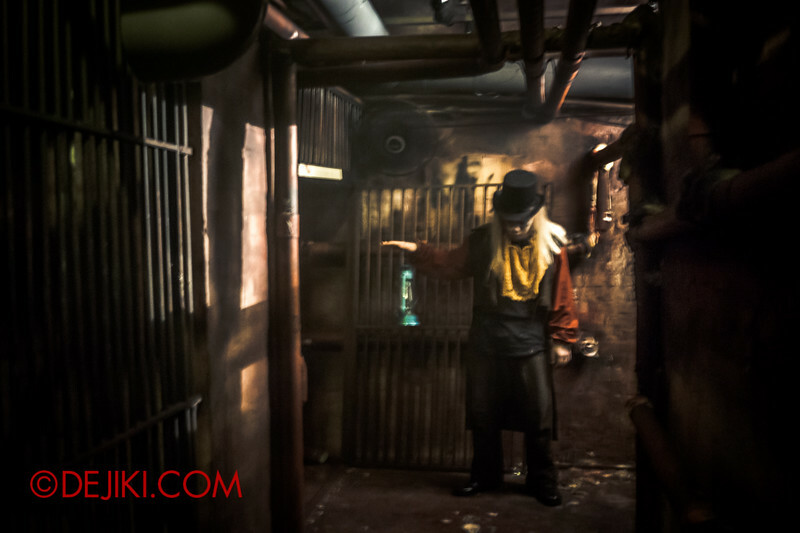 If you are not sure on Friday, I would suggest asking the friendly staff whether it is a good idea to use your pass at a particular haunted house, or if you should go to another one and return when the Fast Pass queue is shorter.